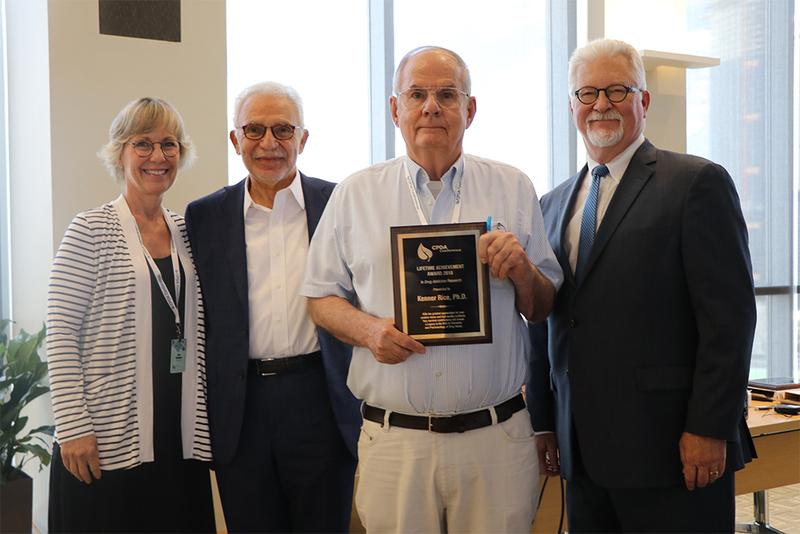 Dr. Kenner Rice received a Lifetime Achievement Award at the 3rd Annual Chemistry and Pharmacology of Drug Abuse Conference, held in Boston on August 2-3, 2018. Pictured from left to right are: Amy Newman, Alex Makriyannis, Kenner Rice and James Bean, Provost and Senior Vice President of Northeastern University where the conference was held. The Chemistry and Pharmacology of Drug Abuse (CPDA) Conference is an annual conference that takes place on the Northeastern University campus. The Conference brings together top medicinal chemists and pharmacologists to discuss the latest in drug abuse research, and how this research applies to the design and testing of future pharmacotherapies that treat drug addiction. Click here to learn more about the CPDA Conference.